He is a journalist of some 35 years’ experience, having worked in print and broadcasting in South Africa, Namibia and the UK, at media groups ranging from the BBC and London Guardian to East London’s Daily Dispatch and the Windhoek Advertiser. He was founding group editor of East Cape News Agencies, a network of independent news agencies during the eighties which was subjected to considerable repression at the hands of the apartheid government. As national editor of radio news and current affairs at the SABC from 1994 to 1999, Krüger formed part of the first post-apartheid management team at the corporation and helped achieve a significant turnaround in the credibility and quality of radio journalism at the corporation. During his spell there, he managed major projects including the coverage of several elections, the Truth Commission, the introduction of sound to bulletins, the overhaul of news and current affairs programming on SAfm and the equalization of news resourcing for African language stations. In 2000, he left the SABC to become an independent journalist and trainer, serving as correspondent for Canadian, Dutch, US and British radio. In 2009, he became director of the newly established Wits Radio Academy, the unit in Wits Journalism that deals with radio (link to radio page). In 2016, he became head of Wits Journalism. He has edited the website www.journalism.co.za, served as Ombud for the Mail &amp; Guardian and spent ten years on the SA Press Appeals Panel. He is a board member of the Freedom of Expression Institute and of Flying Children. 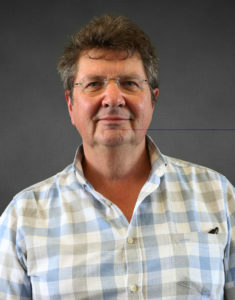 Krüger He a respected commentator on media issues, and has worked as a consultant across Africa. His book Black, white and grey: journalism ethics in South Africa was published by Double Storey in 2004. A second title, The Radio Journalism Toolkit, was published by STE Publishers and the IAJ in 2006, and a revised edition appeared in 2014. Both are widely used as prescribed texts at several colleges and universities in South Africa and abroad. He co-authored the The Healthy Community Radio Station (Link to online version on site) with Romanus Monji and Mike Smurthwaite in 2013, which has been used as the basis for community radio support in Zambia, SA and elsewhere. He has published widely in popular media, in academic journals, and has contributed chapters to various books.